Learn about our transparency policy and items or ideas we wish to disclose to general public in a very clean way. A’ Design Award and Competition is the worlds first ever design award and accolades that was designed based on a solid scientific methodology, advanced design research, studies and surveys to create the highest value for participants. To ensure a self-sustaing platform and continued existence of the competition, and to ensure that it would be free from any political or group pressure, the operation model was designed as an auto-sustaining award, where the entrants would cover the costs of operations, and the contributions of the entrants (i.e. nomination fees) would be used to run the competition, to provide the extensive public relations campaign, for organization of the gala-nights, for publication, advertisement and dissemination of award winning works, for organization of international design exhibitions and for bringing together an expert design award jury, for preparation of the award trophy, the hardcover and digital yearbooks, and online galleries and exhibitions as well as many other items that we could not list. This page includes a list of items that we wish to highlight and disclose. For us, it is important that you have an “informed consent” and a “very good understanding and awareness” about your participation. It is important for us that you read all the material, legal terms and conditions and any other details before joining or uploading your work, we care about your rights and time. If there are any questions unanswered here, they are for sure answered in FAQ pages or could be answered by contacting us. Given this question, we want to clearly state that, the A’ Design Award and Competition is absolutely not free to join; you might have joined for free but someone would be paying for this; it is impossible to get something for nothing and we actually advise designers not to join any free competitions (read our design competition risks page). However, we must disclose that we provide a lot of opportunities for designers to "Join for Free", and indeed many young and upcoming designers who lack the necessary funds do actually take part in these programs and enroll their entries without paying any fees. However our free to join programs are not “free for all”; they require for example demonstration of excellent design talent, or we ask prospective entrants to undertake certain trivial tasks such as printing and putting a poster to universities etc. For businesses, professionals and companies, the competition is never free. We expect any self-respecting, self-sustaining business to do the necessary investments to promote their designs and products, however we do something special other competitions do not; we ensure that there are “No Further Fees”, offer a great “winners’ kit” and of course we also provide “preliminary checks” so that no resources would be wasted. Do you give free entry invitations? Yes and not; The so called “free invitations” are given to press members, jury members, design ambassadors, join-for-free participants, and some of our patrons or sponsors. These “free invitations” are not given for free; press members get them because they publish our winners, jury get them because they take a really long time voting entries, partrons and sponsors get them, because well they actually sponsor the events. Design Ambassador program participants or join-for-free participants get them but they are expected to do some certain, trivial tasks in return.We could also occassionally provide “discounted” entry opportunity some very famous designers, artists or architects to increase the profile of the competition, but we never give free invitations this way, even if you are the most famous designer, because each winner costs us thousands of euros, and we are not able to afford giving free invitations. It is important to remind that the competition is already free if you just want to test your skills; simply submit your entry and get a preliminary score which is an indicative of your design quality. Nominate your product only if you have the funds and the interest in promoting your works. Learn more about the "Free Nomination Tickets" we give. Is it Easy to Submit Works? It is not easy to submit works to the A’ Design Award and Competition, first of all any work must pass a preliminary round for consideration. This prelimniary round is free. Entrants get a score from 0 to 10 for design quality, and 0 to 100 for presentation quality. We will suggest you not to enter your works if your presentation or design qualities are low, and we will suggest you to enroll if you have a very high score. If you decide to enroll your works in the accolades you will need to pay the nomination fees, and even though you have paid the entry fees, if the presentation is not correct, we will email you, update your design status to let you know to help you see any potential issues your design has; we will never publish works that are not well presented, thus we have a very long, 40+ pages documentations and guidelines to prepare the images correctly. To make it easier, we have designed a software called “Submission Optimizer”, most entrants use this software to optimize their submissions to arrive a score of 80 or higher. When all submissions are optimized, and all presentations are equally well done, this ensures us to run a competition in which jury does not vote entries based on presentation, but just the design qualities only. It can take up to 2 weeks to enter a single works, however most entrants are able to complete the process in half a day if both images and text are ready. 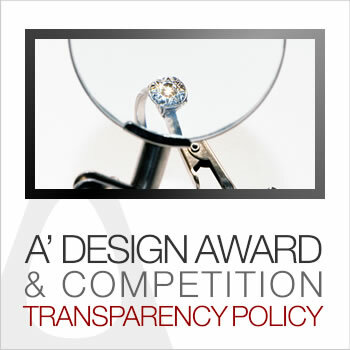 What are the risks of joing A' Design Awards or other Design Competitions? First of all, we shall note that, no matter which design competition, award, contest, challenges or accolades you would participate there are always a series of risks involved. General risks of participating a design competition, regardless of the organizer, could be classified as: 1. Risks related to intellectual properties; industrial design rights and copyrights, 2. Risks related to competition participation agreements; liability conditions such as participant obligations and indemnity 3. Risks related to third parties: organizers, sponsors or jury, 4. Risks related to loss of economic resources, and finally the risk of 5. Inability to take part in further competitions. We shall note that A’ Design Award & Competition, is one of the worlds’ leading design accolades; i.e. the program itself was designed in a scholarly way to create value for participants; special academic research was conducted to assess and reduce potential risks to participants of design competitions and awards. Based on the research findings, the A’ Design Competition was structured in a way to reduce such risks to participants. The issues in our "Risks of Joining Design Competitions" page must be carefully read for increased awareness regarding risks when joining design competitions and to understand any potential risks of taking part in a design contest, accolade or challenge organized by third parties.